Oxford University Press, USA, 9780199939428, 239pp. Chronic unemployment, deindustrialized cities, and mass incarceration are among the grievous social problems that will not yield unless American citizens address them. 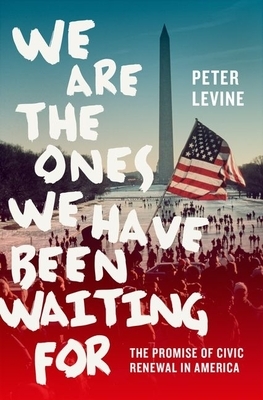 Peter Levine's We Are the Ones We Have Been Waiting For is a primer for anyone motivated to help revive our fragile civic life and restore citizens' public role. After offering a novel theory of active citizenship, a diagnosis of its decline, and a searing critique of our political institutions, Levine-one of America's most influential civic engagement activists-argues that American citizens must address our most challenging issues. People can change the norms and structures of their own communities through deliberative civic action. He illustrates rich and effective civic work by drawing lessons from YouthBuild USA, Everyday Democracy, the Industrial Areas Foundation, and many other civic groups. Their organizers invite all citizens-including traditionally marginalized people, such as low-income teenagers-to address community problems. Levine explores successful efforts from communities across America as well as from democracies overseas. He shows how cities like Bridgeport, CT and Allentown, PA have bounced back from the devastating loss of manufacturing jobs by drawing on robust civic networks. The next step is for the participants in these local efforts to change policies that frustrate civic engagement nationally. Filled with trenchant analysis and strategies for reform, We Are the Ones We Have Been Waiting For analyzes and advocates a new citizen-centered politics capable of tackling problems that cannot be fixed in any other way. Peter Levine is Lincoln Filene Professor of Citizenship and Public Affairs in the Jonathan Tisch College of Citizenship and Public Service at Tufts University and Director of The Center for Information and Research on Civic Learning and Engagement (CIRCLE). He is the author most recently of Reforming the Humanities: Literature and Ethics from Dante through Modern Times and The Future of Democracy: Developing the Next Generation of American Citizens.